This Banana Squash and Leek Soup recipe is the result of a few different factors coming together. 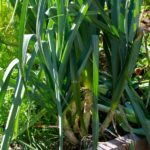 It is the first year we have grown leeks in the new raised garden beds and I needed a suitable venue for these beauties. 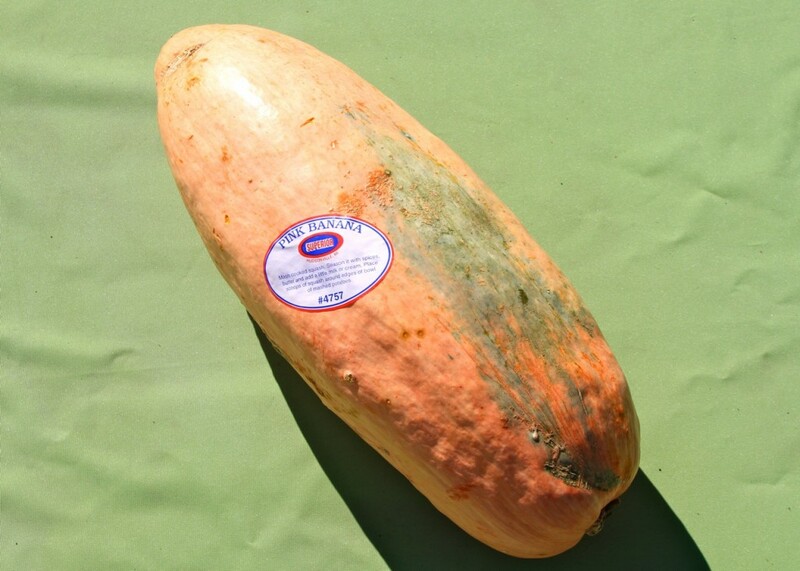 Secondly, I impulsively purchased a gorgeous pink banana squash and found myself wondering what to do with such an enormous vegetable. 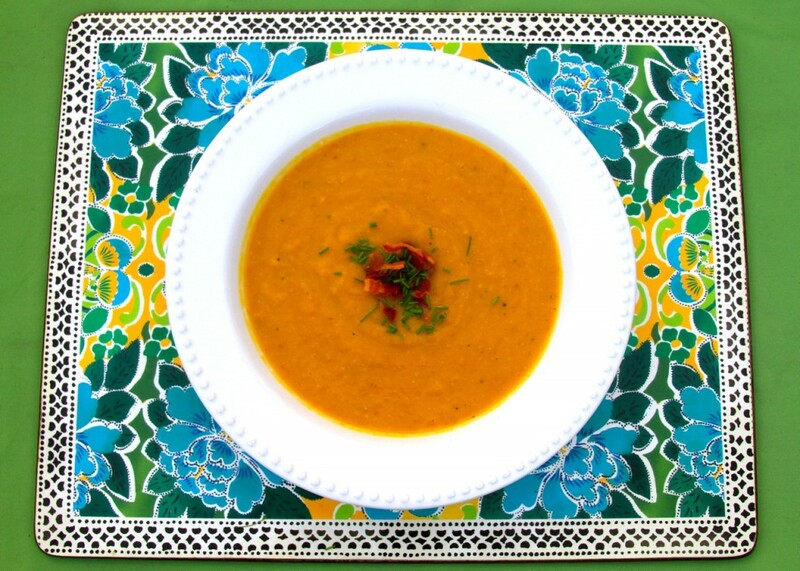 And, of course, the weather is getting cooler and the family is ready for some seasonal soups. 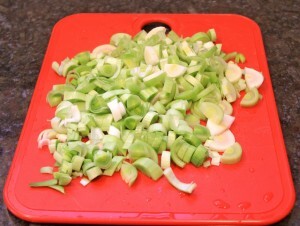 So combining the banana squash and leeks to create a hearty paleo recipe just made sense. Add some bacon and all is right with the world! 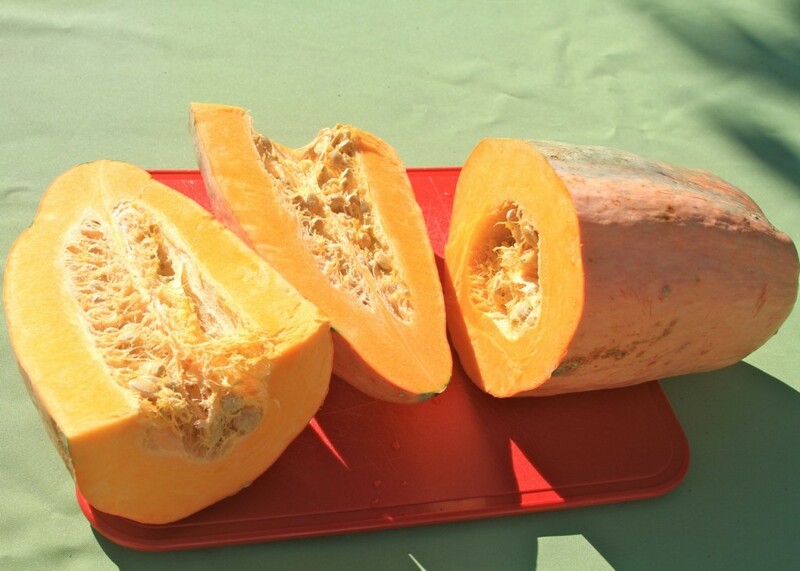 After toting the gigantic pink banana squash home I did a little research. 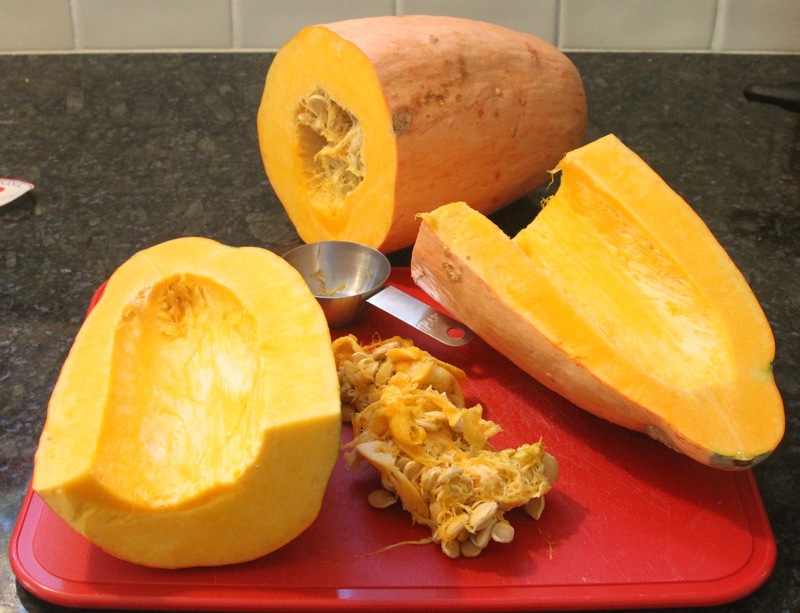 Basically, banana squash comes in different types; pink, blue and orange. They can weigh anywhere from 10 to 70 pounds but are most often found weighing 10 to 20 pounds. The paleo diet excludes white potatoes which are often pared with leeks in soup so I wondered how banana squash stacks up nutritionally. 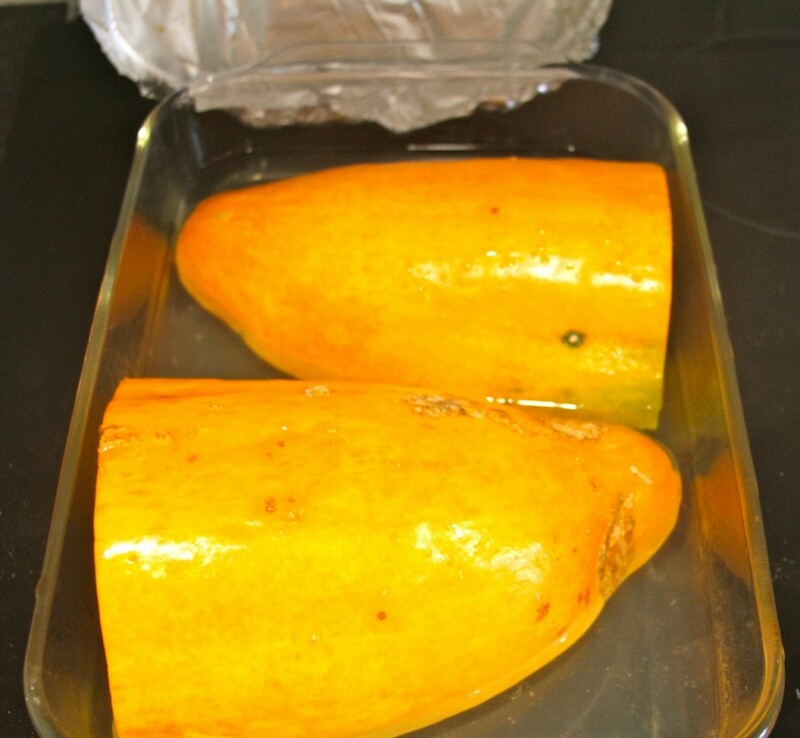 Like other winter squashes, banana squashes are low in calories, high in fiber, potassium and vitamins A and C and the taste is very similar. The table below illustrates that squash is significantly lower in carbohydrates and higher in Vitamin A than potatoes. It is also a prettier color and I’ll admit I’m a sucker for aesthetics. 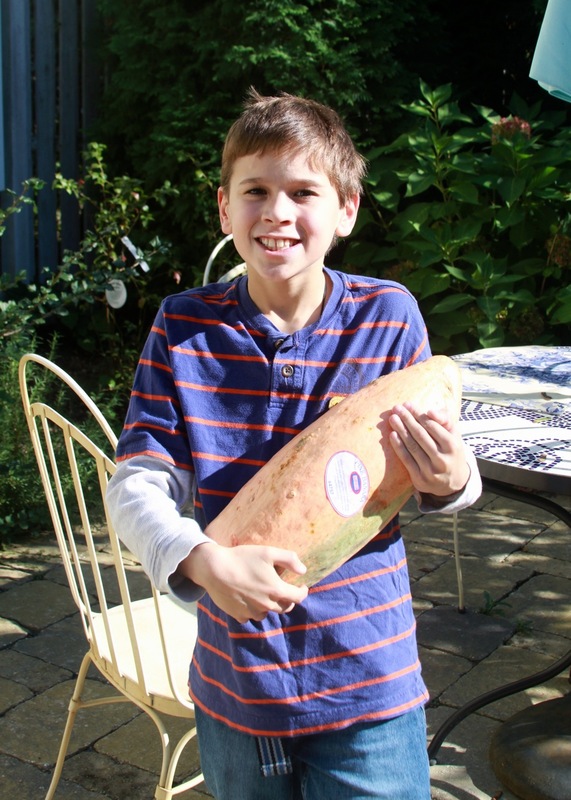 Even though I often use a microwave to prepare smaller squashes, this one was so large it required time in the oven to get the job done. Cut it in half and then cut one half lengthwise. 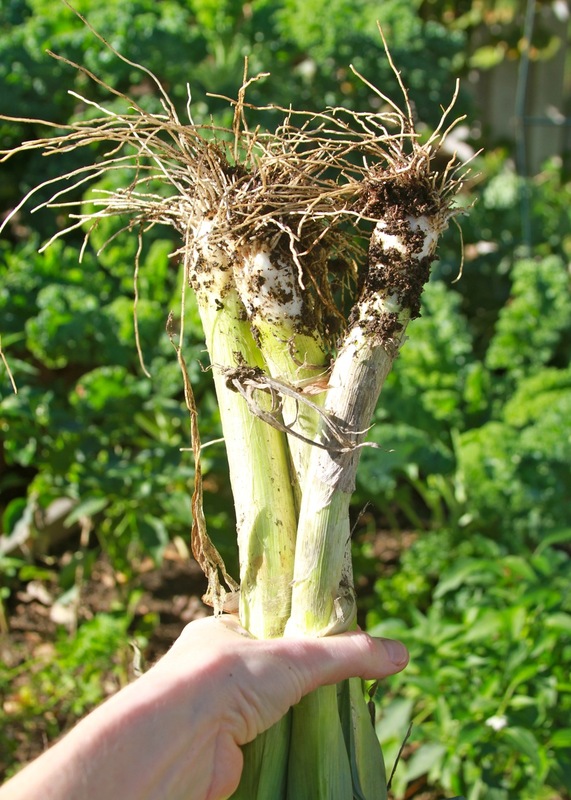 Seed the two split halves with a spoon or a sharp edged measuring cup. Cover and bake at 350° for 1 hour. Scoop out flesh to use in recipe or store in mason jar in refrigerator for up to five days. 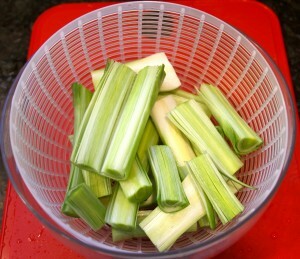 Trim off the little beards at the other end and discard. Use a chef’s knife to slice lengthwise. 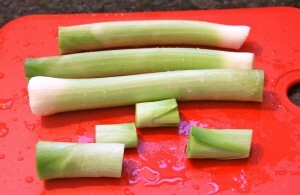 Slice the leeks into 1/4 inch pieces. 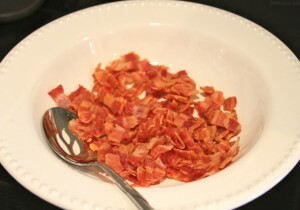 Cut the bacon into small pieces and fry in a large stock pot or Dutch oven. Remove the bacon pieces and set aside. Drain off some of the bacon fat leaving 3-4 tablespoons in the pan. 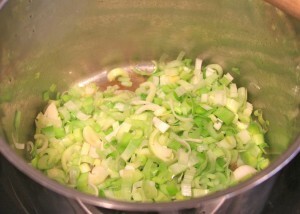 Add the leeks to the hot bacon grease and fry on medium heat until soft and aromatic, about 10 minutes. 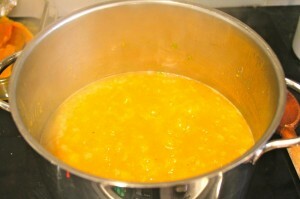 Add the cooked banana squash to the pot, bring to a boil, reduce heat and simmer for about 30 minutes. Add back about 1/3 of the bacon pieces to the pot. 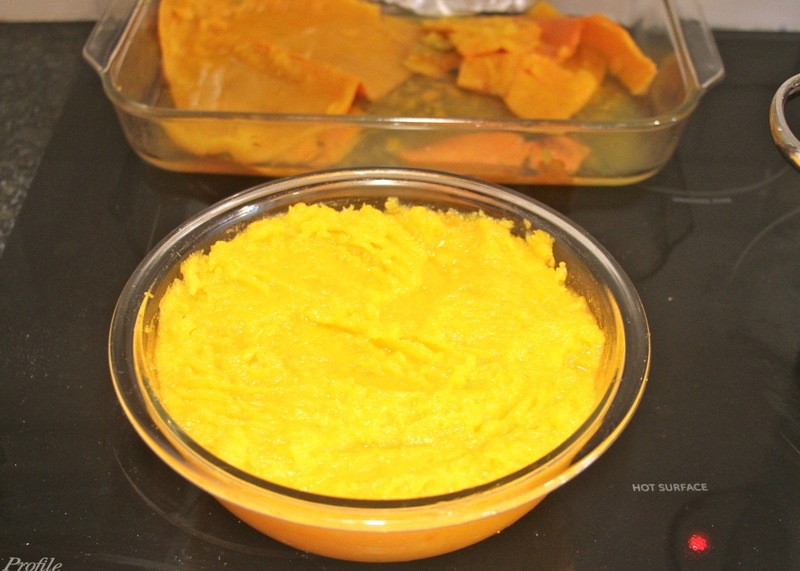 Puree the soup in batches in a blender or use an immersion blender until it is smooth. Season with sea salt and fresh ground black pepper to taste. 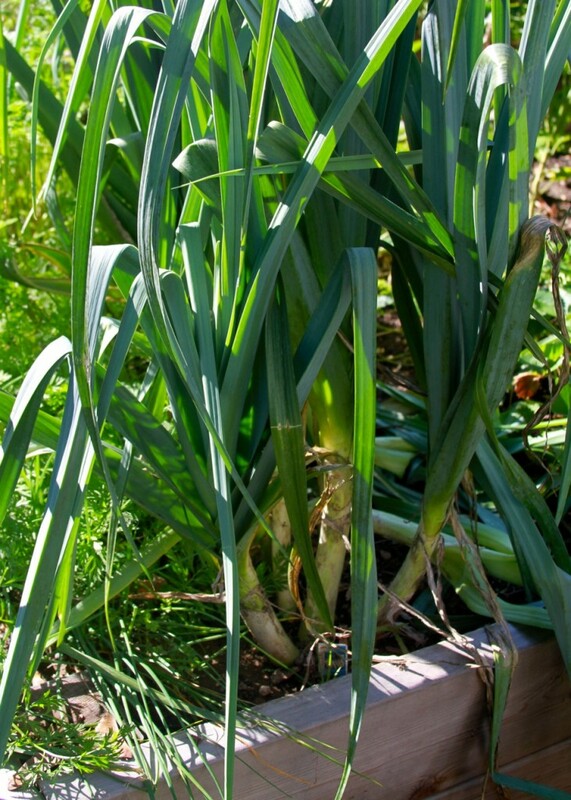 Serve hot, garnished with the remaining crunchy bacon and fresh chives. 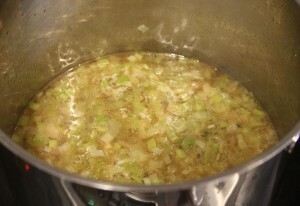 9 Responses to "Banana Squash and Leek Soup with Bacon"
I have never seen a banana squash before but I’m gonna look for one this weekend when I go shopping. This looks fantastic! Thanks, Trevor. This is the first time I have used one and it was quite tasty. I’d love to hear what you think if you do try the recipe. Wow, now I wished I still had some of mine! Well, the farmer’s market is open tomorrow so maybe I’ll get lucky and find another one, so I can try this out because it sounds fantastic! 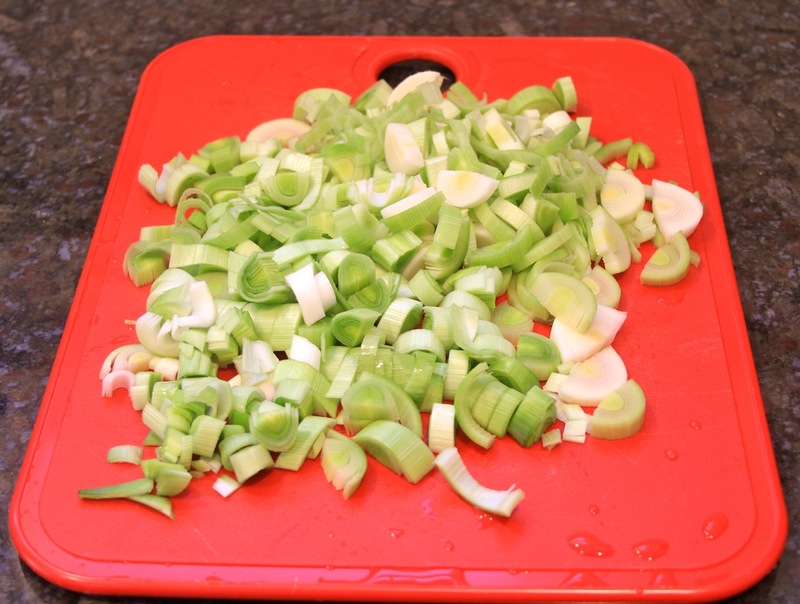 Next on my list is your recipe for banana squash that uses the peppers and onions. Is there a method to cut down the size of the recipes to 2-3 servings? I Made this with butternut squash. It was delicious! Thanks for the recipe.